A New Way of Chipping! When I was at the Fancy Food Show in NYC a few weeks ago, I came across the Beanfield’s Snacks booth. I had heard of them because my cousin in-law Brian loves them. I had never tasted them, so I thought I’d give one a try. Well, after 20 minutes of learning the company story from one of the founders Roy, and eating my weight in chips(!) I was hooked! At Beanfield’s they have this amazing mission to change the way Americans eat by providing tasty snacks that are vegan, GMO free, and bean based. Check out the rest of their story. 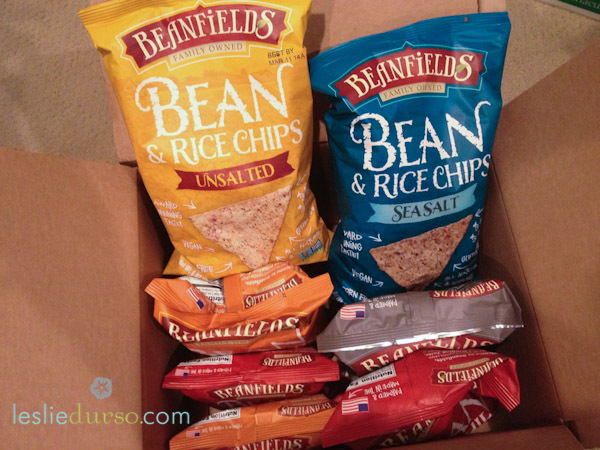 I was super duper excited when a box of Beanfield’s chips landed on my doorstep the other day! First off, all their chips are vegan! Even the nacho flavor (which I think it my favorite)! Secondly, these chips are fundamentally different because they are made with beans not corn or potato. Beans are the most water efficient protein out there and beans require half the total energy of other crops. So why not make chips out of them!? Well thank goodness Beanfield’s did! Need more convincing to give them a try? How about that they are the best tasting chip I think I’ve ever had? Good enough for you? They come in 5 flavors: Nacho, Sea Salt, Pico De Gallo, Salt & Pepper, and Unsalted. Just bought these the other day at my local organic store! They were on sale and I picked up 2. The unsalted and nacho. I have had to lock them up so I can only nosh when needed because I could seriously eat an entire bag in 1 sitting. So good. I LOVE these chips! It’s always been difficult to find chips without corn. Beanfields has done an amazing job of making a corn-free tortilla chip that has a great snappy texture and delicious taste. Two issues I have with these chips are; difficulty in finding the Beanfields brand at any of the Whole Foods Markets in Sonoma County, CA. ; when I have a bag of these yummy chips in my hand I eat the entire bag! I’ve tried the Sea Salt and Nacho. I think Nacho is my favorite! So sinfully good!! Thanks for this great review! I’m posting it on our FB page. I just want to let your readers know that Beanfields is on sale at all the Whole foods in your area for the month of August. There are also some demos coming up for reader who want to taste them before they buy. WFM Cottingtown should have all flavors in stock. They are having a demo on 8/10. (call for exact time) Sonoma also has most everything except Salt and Pepper thier demo is 8/16. Sorry you had trouble finding them, Beachmama! Stay tuned for co-op sales later in the month. Beanfields….oh my heart is in the bag there. Have you had the Pico de Gallo? Texas in on great big ol bite! Love these. Wish I could get our lil ol store to carry them. But I can order them online at least! These are my fav! I banned all types and forms of corn in my house over three months ago… (it’s all GMO) and I have been buying these at Whole Foods. My sister buys them by cases LOL! My fav are non salted plain! yay! Those are def my favorite for dips and salsas! I can’t get enough of the nacho ones either! I am in love!!! I missed Doritos when I became a clean, nearly vegan eater. Now I can have my chips and eat them too 🙂 Even my little one and husband love them. I have a question though, are these chips fried still or are they baked?